Purpose: We show in this study that if a root anomaly does not permit access to the disc space in the usual way, the technique we define here can be used. If the patient has a root anomaly or an abnormal root configuration at this level, inevitably, an anterior approach is preferred. Materials and Methods: The patient's previous skin incision was used; the L5-S1 space was reached laterally without entering the midline. The dura in the midline and the L5 and S1 roots on both sides were exposed. 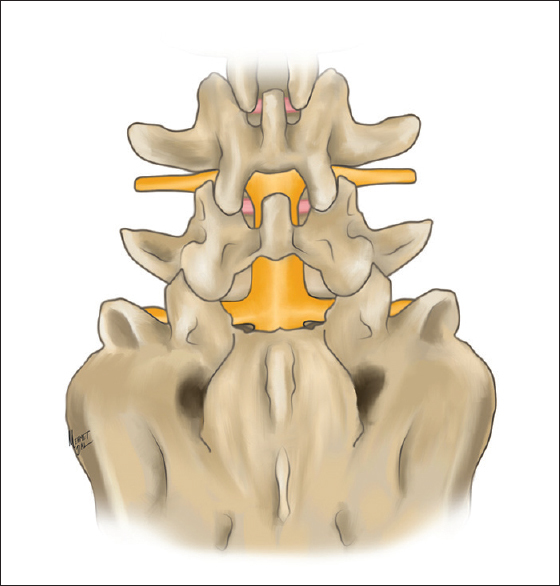 They were reached through the adjacent points of both S1 pedicles by going around the upper edge of the sacrum, allowing the disc space to be evacuated. An autologous bone graft was placed on both sides of the space. T10-S1 pedicle screws were placed. An L1 pedicle osteotomy was performed and joined using two rods. Results: The patient's back and leg pain disappeared after the surgery. The plain X-rays showed that the sagittal balance was restored. In this case, it is impossible to see the disc space because the nerve root blocks its view. Conclusions: The classic approach in such cases is to perform a fusion by either a transperitoneal or retroperitoneal approach or by performing a posterior intertransverse fusion. However, it is very challenging to execute an anterior L5-S1 fusion on a patient with pelvic retroversion. When the spinopelvic junction is included in the fusion, one common problem observed is pseudarthrosis. 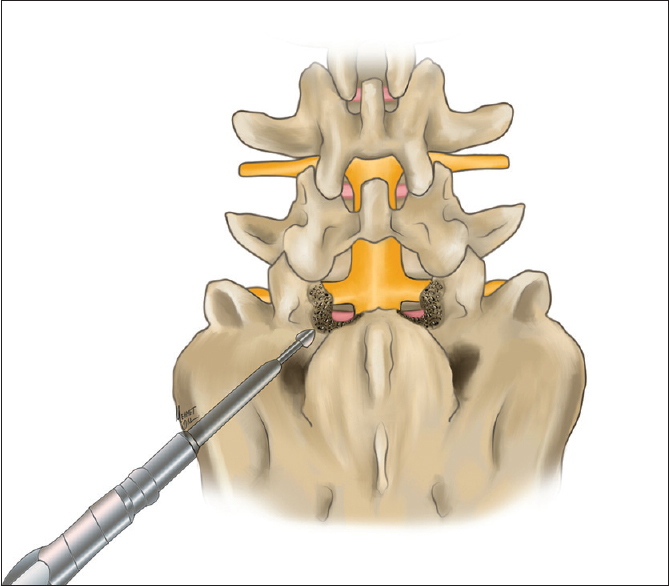 The surgical technique defined in this article makes it possible to drill the bone tissue through the disc space and the upper surface of the sacrum, accessing the pedicle bone. 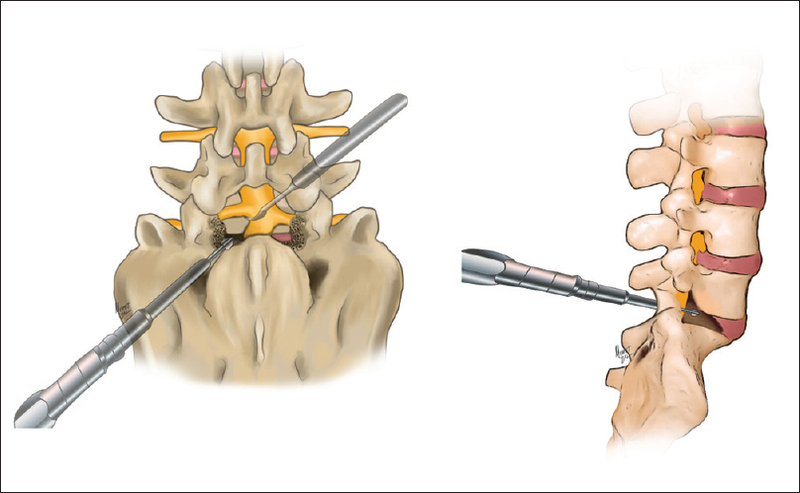 Then, a discectomy is performed at the disc space, a bone graft is placed, and a posterior lumbar interbody fusion is performed. There are many reasons why the L5-S1 level can require fusion, such as degenerative disc disease, spondylolisthesis, or during a deformity surgery. Normally, interbody fusion can be performed using either an anterior or a posterior approach. The fact that the surgery can be performed without entering the abdominal cavity is the main advantage of the posterior approach. The posterior interbody fusion technique can be found in surgical textbooks. However, if the patient has a root anomaly or an abnormal root configuration at this level, inevitably, an anterior approach is preferred. In this paper, if the root anomaly does not allow access to the disc space in the usual way, the technique we have defined can be used. A 55-year-old patient who previously underwent lumbar stenosis surgery was operated on seven times due to his/her continuing complaints. The main complaint of the patient was the inability to stand straight and continuing back and left leg pain. A neurological examination revealed no abnormalities other than 1–2/5 motor strength loss in the left leg dorsiflexion. In the preoperative X-rays of the patient, the patient attempted to flex his/her knees while retroverting the pelvis. T2-weighted magnetic resonance imaging sagittal and axial sections showed a left L5-S1 foraminal stenosis. Nevertheless, it was observed that a spinal alignment could not be achieved, and the patient had a positive sagittal imbalance [Figure 1]. To restore the patient's sagittal balance, an L1 osteotomy was planned in addition to L5-S1 facetectomy, L5-S1 discectomy, and interbody fusion. A facetectomy was planned due to the removal of the lamina from one of the previous operations. The patient was placed on the operation table in a prone position under general anesthesia. The patient's previous skin incision was used and extended to T10 proximally and to the pelvis below. The level was determined under fluoroscopy. Because the patient previously underwent an L5 total laminectomy, the L5-S1 space was reached from a lateral approach without entering the midline. The dura in the midline and the L5 and S1 roots on both sides were exposed. To perform an anterior fusion on the L5-S1 disc space, the facets were removed bilaterally. It was observed that the thick L5 root stood with a vertical angle just on the disc space of the L5-S1 disc. It was found that the disc space was highly stenotic due to pelvic retroversion. Both the root anomaly and the upper posterior edge of the sacrum prevented approaching the space [Figure 2]. Therefore, the disc space was reached through the adjacent points of both S1 pedicles by going around the upper edge of the sacrum under a microscope and with a high-speed burr [Figure 3] and [Figure 4]. The disc space was evacuated with curettes and disc rongeurs. An autologous bone graft was placed on both sides of the space [Figure 5]. T10-S1 pedicle screws were placed. L1 pedicle osteotomy was performed and joined using two rods. The table was set to a deflexion position, the desired lumbar lordosis was established, and the instrumentation was fixed by tightening the screws. The necessary decortication was made for the fusion, and a bone graft was placed. The surgery was finalized after bleeding control. It was observed that the patient's back and leg pain disappeared after the surgery. The patient could stand straight on his/her own and walk without any support. 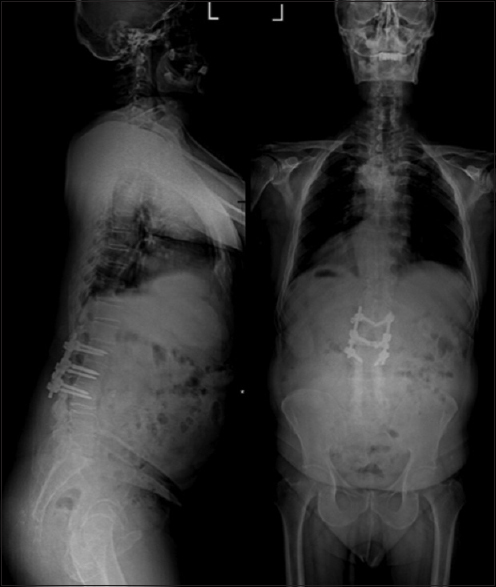 After the surgery, it was observed in the X-rays that sagittal balance was restored, and the patient could stand up straight without the need for knee flexion and pelvic retroversion [Figure 6]. In this case, it is impossible to see the disc space because the nerve root blocks its view. Lumber root anomalies have been defined in detail by Neidre and MacNab. They defined three groups based on the position of the nerve at the exit from the dura. Based on their classification in “Type 1 b,” the cranial nerve root forms a 90° angle with the conjoined nerve root, and then, the cranial nerve root proceeds to the inner foramen. In this case, it is impossible to see the disc space because of the nerve root blocking vision. Likewise, in our case, when performing an interbody fusion, a discectomy was not possible. In 2013, Burke mentioned that confluent nerve roots, formed by nerve roots exiting the same thecal sac, filled the whole foramen because of the thickness of multiple roots.,, One of the important causes of complications during surgery is a thick and high traction-resistant nerve root anomaly. During our surgery, we encountered a root branching at a right angle from the thecal sac, which prevented us from seeing the disc. In this patient, the posterior disc height, formed by the pelvic retroversion, was closed due to the approaching posterior sides of the two vertebrates. Due to either a height loss or a nerve root anomaly blocking the disc space vision caused by degenerative processes, it was impossible to perform posterior lumbar interbody fusion (PLIF) on the patient. The classic, preferred approach in such cases is to perform a fusion, transperitoneal and retroperitoneal approach or to perform a posterior intertransverse fusion. However, it is very challenging to execute an anterior L5-S1 fusion on a patient with a pelvic retroversion. When a spinopelvic junction is included in a fusion, one common problem observed is pseudarthrosis. Apart from pseudarthrosis in intertransverse fusion, the most important issue with spinopelvic fixation with pseudarthrosis is the fusion surgery at the L5-S1 disc space.,, Implant failure is inevitable in nonfusion patients after implantation. While the rate of pseudarthrosis after the first surgery is 10%, this rate increases up to 20% after the second surgery.,, The rate of pseudarthrosis ranges from 11% to 17% after the first surgery, while this rate ranges from 0% to 15% after the second surgery., Although there are a limited number of studies on patients who underwent revision surgery due to pseudarthrosis, 17 out of 27 patients who underwent combined anterior–posterior surgery developed pseudarthrosis, while 3 (6%) of these patients developed pseudarthrosis after the second surgery., Considering the high rate of pseudarthrosis at L5-S1 level, a 360° fusion should be considered for L5-S1 segment, particularly for long constructions.,,,, When the lumbosacral junction must be included in the fusion, especially for patients who need an L5-S1 anterior fusion, it is harder to approach the L5-S1 interdiscal space, particularly due to the pelvic retroversion., In our case, it was not possible to enter the disc space when the foramen stands with a vertical angle just on the disc space of S1 root. Therefore, PLIF is a safe method for normal cases. 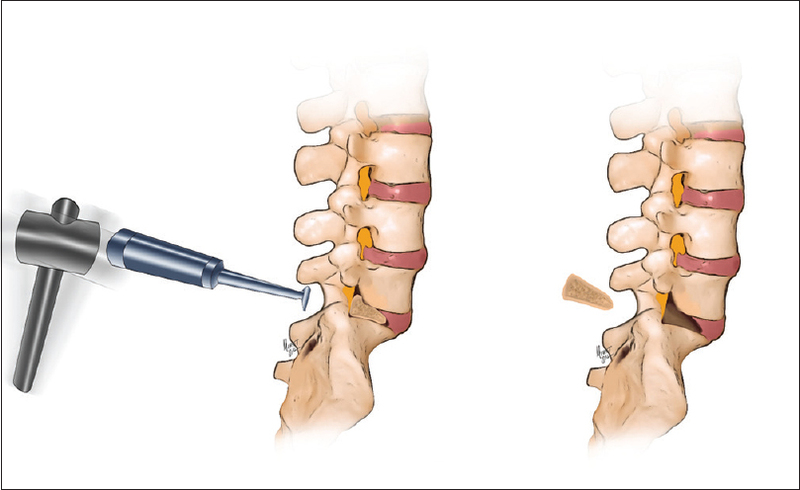 The surgical technique defined in this article makes it possible to drill the bone tissue through the disc space and the upper surface of the sacrum until reaching the pedicle bone. Then, a discectomy is performed at the disc space, a bone graft is implanted, and a PLIF is performed. A review of the literature showed that a similar surgical technique had not been described. Due to the lack of an equivalent technique, we are proposing that this technique be used in similar cases. If the root anomaly does not allow access to the disc space in the usual way the surgical technique defined in this article makes it possible to drill the bone tissue through the disc space and the upper surface of the sacrum until reaching the pedicle bone. Neidre A, MacNab I. Anomalies of the lumbosacral nerve roots. Review of 16 cases and classification. Spine (Phila Pa 1976) 1983;8:294-9. Benzel EC. Biomechanics of Spine Stabilization, Principles and Clinical Practice. Health Professions Division, Michigan University: McGraw-Hill; 1995. Berthonnaud E, Dimnet J, Roussouly P, Labelle H. Analysis of the sagittal balance of the spine and pelvis using shape and orientation parameters. J Spinal Disord Tech 2005;18:40-7. Hann S, Sharan A. Dual occipital and supraorbital nerve stimulation for chronic migraine: A single-center experience, review of literature, and surgical considerations. Neurosurg Focus 2013;35:E9. Dede O, Thuillier D, Pekmezci M, Ames CP, Hu SS, Berven SH, et al. Revision surgery for lumbar pseudarthrosis. Spine J 2015;15:977-82. Finger T, Bayerl S, Onken J, Czabanka M, Woitzik J, Vajkoczy P, et al. Sacropelvic fixation versus fusion to the sacrum for spondylodesis in multilevel degenerative spine disease. Eur Spine J 2014;23:1013-20. Lonstein JE. Salvage surgery. In: Frymoyer JW, Wiesel SW editors. The Adult and Pediatric Spine. 3rd ed. Philadelphia: Lippincott Williams and Wilkins; 2004. p. 505-25. Mac-Thiong JM, Berthonnaud E, Dimar JR 2nd, Betz RR, Labelle H. Sagittal alignment of the spine and pelvis during growth. Spine (Phila Pa 1976) 2004;29:1642-7. Roussouly P, Gollogly S, Berthonnaud E, Dimnet J. Classification of the normal variation in the sagittal alignment of the human lumbar spine and pelvis in the standing position. Spine (Phila Pa 1976) 2005;30:346-53. Shen FH, Mason JR, Shimer AL, Arlet VM. Pelvic fixation for adult scoliosis. Eur Spine J 2013;22 Suppl 2:S265-75. Kleck CJ, Illing D, Lindley EM, Noshchenko A, Patel VV, Barton C, et al. Strain in posterior instrumentation resulted by different combinations of posterior and anterior devices for long spine fusion constructs. Spine Deform 2017;5:27-36. Schwab F, Lafage V, Boyce R, Skalli W, Farcy JP. Gravity line analysis in adult volunteers: Age-related correlation with spinal parameters, pelvic parameters, and foot position. Spine (Phila Pa 1976) 2006;31:E959-67. Lafage V, Schwab F, Skalli W, Hawkinson N, Gagey PM, Ondra S, et al. Standing balance and sagittal plane spinal deformity: Analysis of spinopelvic and gravity line parameters. Spine (Phila Pa 1976) 2008;33:1572-8. Legaye J, Duval-Beaupère G. Sagittal plane alignment of the spine and gravity: A radiological and clinical evaluation. Acta Orthop Belg 2005;71:213-20. Palejwala A, Fridley J, Jea A. Transsacral transdiscal L5-S1 screws for the management of high-grade spondylolisthesis in an adolescent. J Neurosurg Pediatr 2016;17:645-50. Yasuda T, Hasegawa T, Yamato Y, Kobayashi S, Togawa D, Banno T, et al. 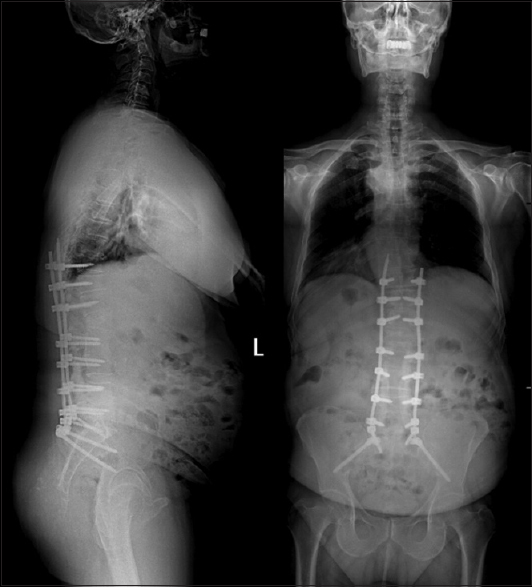 Lumbosacral junctional failures after long spinal fusion for adult spinal deformity-which vertebra is the preferred distal instrumented vertebra? Spine Deform 2016;4:378-84. Schwab F, Lafage V, Patel A, Farcy JP. Sagittal plane considerations and the pelvis in the adult patient. Spine (Phila Pa 1976) 2009;34:1828-33.